The above photo – my first public appearance as an amateur photographer – is in honour of Father James Profit; Jesuit, ex-IJC Executive Director and fierce proponent of potatoes and all things PEI-related! Father Jim will be the recipient of the Ignatius Jesuit Centre Award for his exemplary and varied contributions over many (sorry, Jim – several) years to all facets of the organization. To attempt to list James’ many accomplishments, activities and interests would be a major act of hubris, suffice to say that this award is richly deserved! Personally, I would like to thank him for his wonderful help with the kitchen herb garden. Even when he was being pulled in 1,000 different directions as Executive Director, he saw that I needed help (and knowledge) and pitched in. Without him, the garden would be straggly and stunted … and a great deal smaller! Thanks to Jim, Cecelia (last year’s recipient of the award), Monica (our dearly beloved and departed housekeeper), Craig and Stas (past and present Land Managers), I can trot downstairs to pick fresh herbs and flowers for flavouring and garnish. It is useful and a thing of beauty – as you can see from the backdrop to this blog. The award will be presented at next Saturday’s Organic Harvest Feast – our annual major fundraising dinner. This is the second year that we will be grilling and eating outdoors. We expect 150 people, all seated under a tent pitched on the front lawn of Loyola House and decorated in a harvest theme. Most of the menu is based around produce from our farm – the big exception being the meat course, of course! We are getting organic, local chickens from Fenwood Farm, which will be brined and grilled on the bone for a rich, smoky flavour. Much of the labour has and will be volunteer, which is quite inspirational. It remains a large undertaking which will consume most of my attention for the next week, so I beg you to forgive me if the posts are a bit sketchy until next Sunday. Now that I know how, I will then be able to post a picture or two of the excitment for your delectation. I will leave you with my favourite potato preparation – so simple it hardly qualifies as a “recipe”! Mix the marinade well and toss potatoes in it. 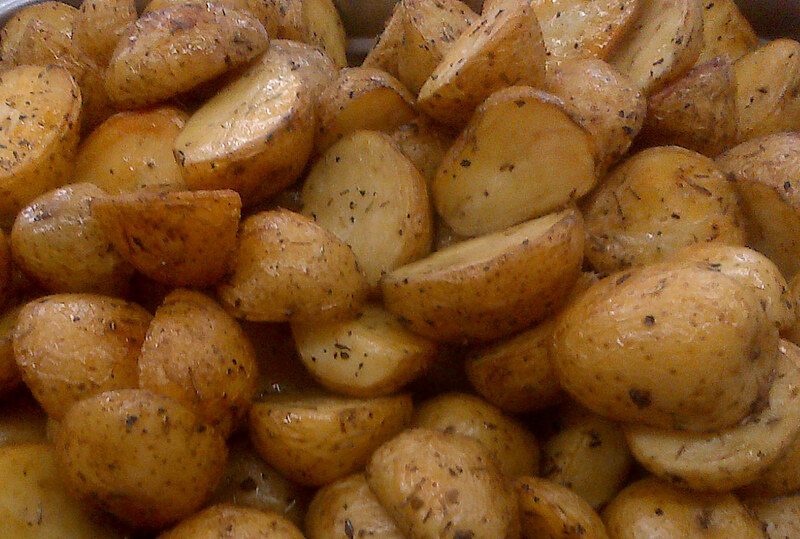 Minis are good – or regular potatoes cut up into (polite) mouthful sizes. Roast at 350 F (sorry, Dad) until done. The key to this dish is to take it out of the oven every 20 minutes or so and stir it thoroughly, making sure to pick up the marinade off of the parchment paper (or whatever baking surface you use) and re-distribute it over the potatoes. If you don’t stir enough, the spices slide to the bottom and burn. You want the spices sinking into the potatoes, then into your tastebuds, making you happy! If you enjoy the above photo, it is now available as a greeting card in the Loyola House Lounge! Chow! oops, I mean Ciao!